Weegul, wobbling in on our final day! 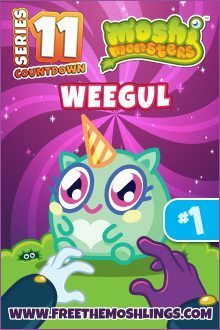 It is here, our final day, after Freddie graced my blog , we now have the uber-cute, Weegul for you. This little fella is a very demanding wee guy, despite the rather cutesy appearances. He is a bit like a diva rock star, without the rock…if they don’t get their way then you will definitely know about it. They are always asking passers-by to plop a pair of glacé gooberries on their rather odd horns. They are made out of wafers, you know, though horns….and look remarkably like one of the ice cream cones you might find within the moshi game, don’t they? Weegul also likes to have his cushions plumped and his back scratched; he’s a bit of a softie, and everything has to be just right! Personality: Spolit, demanding and very persuasive, so even if you don’t want to help them out, you might just find that you are helping Weegul the Wobbly Dobbly despite your misgivings!